Public and private organisations have a high rate of interaction, i.e. all their external business processes are de-facto inter-organisational. Besides traditional non-functional aspects, inter-organisational processes demand a high rate of interoperability. The authors present a model-driven development process explicitly considering interoperability levels as development process phases. Applying this development process has shown that it substantially raises the interoperability awareness for all associated actors. To further improve “common sense” between the involved actors, we use an integrated modelling language approach. For this, the metamodels of the used modelling languages are integrated using metamodel integration based on metamodel mappings and integration rules. The approach is demonstrated by integrating BPMN-based business process modelling and CCTS-based data modelling into a consolidated modelling language. Considering the integrated metamodel, the authors apply model transformation to re-use model information along the described development phases, e.g. business process definitions are used to generate skeletons for executable workflows and business document definitions are used to generate data model definitions and associated data schemata. The application of the model-driven development process, the metamodel integration as well as the model transformation is illustrated by a case study of electronic VAT statement transaction. Nearly all public and private organisations have a high rate of interaction between its own business processes and the business processes of the related business partners. To efficiently support this interaction, various aspects of interoperability have to be considered. Interoperability in this context is seen as ‘‘the ability of a system or a product to work together with other systems or products without special effort’’ (INTEROP, 2009). According to Kühn et al. (2001) interoperability of organisations can be structured into four levels, which can be further classified into the business domain and the ICT domain (Ralyté, Jeusfeld, Backlund, Kühn & Arni-Bloch, 2008). 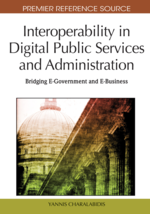 On a strategic level, interoperability has to consider governance as well as issues of strategic alignment. Two organisations will be interoperable on strategic level, if their goals, principles and business attitudes either cover or complement each other (Kaplan & Norton, 1996; Porter, 2004; Kaplan & Norton, 2006). To achieve interoperability on operational level, the business processes of the two organisations have to be aligned. This includes agreement on the properties of exchanged products and the quality levels of exchanged services. Additionally, the interaction points of the business processes, the related business rules and the exchanged business documents have to be specified. The implementation of interoperable business processes is done on the development level. For the implementation either organisational techniques such as trainings and workshops are used, or Software Engineering techniques are applied to implement business processes using software technology. The execution of business processes within software technology needs open and distributed information systems and competitive IT organisations to operate and maintain the related information and communication technology (ICT). How to organise the development process. This includes a clear description of the phases and steps to undertake in the development of interoperable business processes, the role descriptions of the involved actors, and the model artefacts to be created in the phases and steps of the development process. How to capture a common understanding about all involved entities in the business processes. This includes how to capture the business processes, their interactions, the exchanged business documents and business information, the requirements for the underlying information systems, the design of the business data, the design of executable workflows, and necessary aspects of the underlying technical infrastructure. How to re-use the captured information along the development process. This includes the application of modern software development techniques such as service- and aspect-orientation, process orchestration, process choreography, semantic technologies, and advanced data-modelling techniques. For the first aspect we present a model-driven development process structured into four phases which are derived from the four interoperability levels (see Figure 1). For each phase we describe the involved actors, the steps to be executed, the questions to be answered and the model artefacts to be created. For the second aspect we present an approach how metamodel integration (Zivkovic, Kühn & Karagiannis, 2007) can be used to create either common metamodels or to map existing metamodels to be used in conjunction. These metamodels are used as a common schema to share all necessary information from strategic information down to information relevant for the process execution.